Working with Tom Kitt and Amanda Green, Lin-Manuel Miranda (Hamilton) co-wrote the music for Bring It On The Musical, the stage adaptation of the 2000 cheerleading largely forgettable comedy with the same name. It premiered in America in 2011. Campbell is a popular girl at Truman High School - she's been named captain of the squad! But, an unexpected redistricting has forced her to spend her final year of high school at the neighboring Jackson High School. Despite having the deck stacked against her, Campbell befriends the dance crew girls and, along with their headstrong and hardworking leader, Danielle, manages to form a powerhouse squad for the ultimate competition – the National Championships. There are two things that stand out in this musical: the cast and the catchy songs. The British Theatre Academy is a talent hotbed: Robyn McIntyre as Campbell, Kristine Kruse as Bridget, Sydnie Hocknell, Chisara Agor - and all the others actors of the (very large) cast dance - act and sing with enthusiasm and spirit. I can definitely see some future stars there. Southwark Playhouse has a spatially limited stage and it can get a bit crowded – you don’t know where to look at. Also, the quality of the sound is not perfect. The problem of Bring it on is the silly plot. Battling cheerleaders is not a very intriguing story and by the end of the show I would not really care about any of the characters. 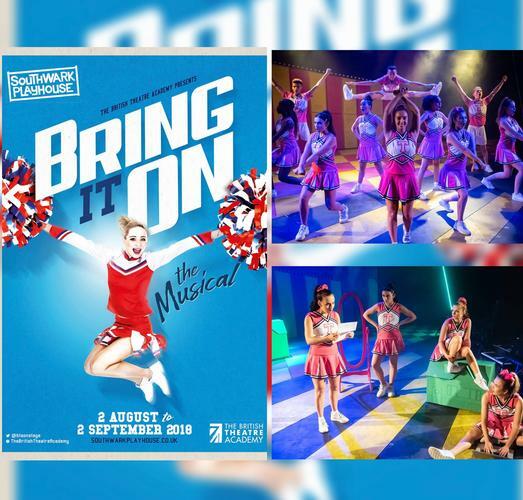 But with good moments of humour, a fabulous dancing, a great cast, catchy songs, this feel-good camp musical is perfect summer entertainment that will put a smile on your face.